When the first boatload of deported migrants arrived Monday at the Turkish port of Dikili, a small group of Turkish human rights activists turned up to welcome them. Turkey is expecting to receive another group of 200 migrants deported from Greece on Friday, as part of the deal reached in March between the European Union and Ankara to alleviate Europe's migrant crisis. But there is also nervousness among some Turks who question whether their country can and should absorb the refugees who do not return to their nations of origin. The deportees from Pakistan and other countries who arrived in Turkey from Greece this week have been whisked away from the docks where they disembarked and taken to a reception and removal center in Kirklareli, 500 kilometers away. The deal brings a list of incentives for Turkey, including billions of dollars in aid and the possibility of visa-free travel to Europe, as well as eventual accession to the EU. But some Turks condemn the deal, saying it does little to widen their long-sought access to Europe. For Turkey's President Recep Tayyip Erdogan, the agreement is an opportunity to raise his standing at a time when he is under scrutiny for his government's offensive against Kurdish separatists in Turkey's southeast and its crackdown on the media. This week, Erdogan criticized the European Union's approach to the migration crisis. "Did we turn Syrians back? No, we didn't, but they [EU nations] did," he said in Ankara. "By way of placing razor wire, they did not let these people into their countries. We see who is dying on the Aegean Sea, but the number of those rescued by us on the Aegean is 100,000." Officials say more than 400 people have died over the past year while trying to make the short, but dangerous, crossing between Turkey and the Greek isles. Under the deal reached in mid-March, Turkey will receive more than $3 billion in aid to take care of the refugees. For every migrant returned, Turkey sends one Syrian refugee to the EU. Greece and the EU are to deport all migrants who arrived on Greek soil after March 20. While Greece reports that between 300 and 500 people continue to turn up on its shores daily, that number reflects a considerable drop from before the agreement. In Izmir, Turkey's third-largest city, many migrants found acceptance, especially in the city's Basmane neighborhood, where many of them congregated before setting out on the sea journey. Today, parks and a roundabout once filled with migrants now sit empty as the prospect of being returned to Turkey deters many from coming here to make the crossing. Their presence is missed by some in Basmane. "They do no harm to us, no harm at all. 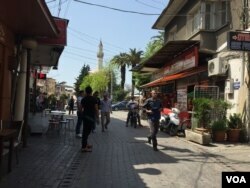 On the contrary, the business I did last year was double than this year," Aydogan Kirisci, a spice vendor in Izmir's Basmane neighborhood, told VOA. "When they were here, I was doing better business." Not all Turks are as ready to accept the newcomers, and skepticism about continuing to host them in large numbers has grown, especially after a series of deadly terrorist attacks in the country recently. That skepticism is shared even by those who see the benefits Turkey stands to reap by taking back the migrants. In Izmir's city center, scores of Turkish travelers form a long line in the early morning hours in front of a private business that processes visas for Turks who want to visit EU countries. One of them, a marketing manager who identified himself only as Emre, said the prospect of having visa-free travel in the EU is, for him, not enough to justify the agreement. Some wonder how long the migrants will stay. "This is the main thing: that we don't know what [is] going to happen because we don't know those people and where they will live and if they [are given] a place anywhere in Turkey if it is a secured place," he told VOA. Turkey's government is ensuring that the deported migrants remain out of sight, a move analysts say is meant, in part, to minimize tensions. Ankara says Syrians will be placed in refugee camps, and others will be sent to their home countries. Cansu Akbas Demirel, an international relations and migration studies scholar at Ege University in Izmir, says the government's approach reflects the anxiety and fear of many Turks that the migrants may never leave. "Turkish people are now understanding they [the migrants] will not go to back to their country, especially in the [next] 10 years, maybe more. Maybe they will become citizens of Turkey," she told VOA.